Here is an interesting reference to this blog. Though there is communication apart from talking, I hope that there will soon be software that recognizes my German accent without long training, so that I can tell my programs what to do and to record. 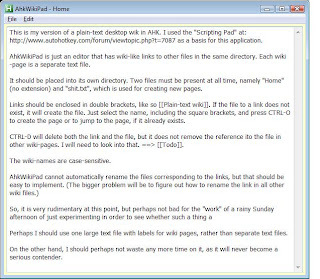 Mempad is a small and very efficient "plain text outliner and note taking program with a structured index. All pages are stored in a single file." "The program offers standard editing functions including cut, copy, paste, undo, date/time insert, drag&drop, and supports Web links as well as network and local file or folder links (full path not required) and internal page links. Environmental variables can be used in file links to run programs, for example." It's free and it does everything as promised. I do not use it much anymore, but from among the other applications developed by Horst Schaeffer, I do use Popsel, which "offers simple pop-up menus to launch programs, documents, web links, Explorer windows, batch scripts etc." I run various AutoHotkey scripts and other programs from it. 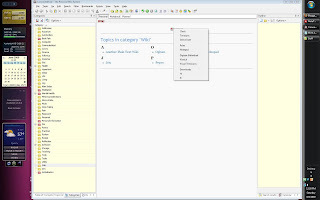 In fact, I have it embedded in the header of my ConnectedText projects to start small utilities and programs. TimeSync is another one of these utilities I regularly use. and then click "Generate the Diagram!"